When you start out on a paleo lifestyle, you will probably come across many recipes that have ingredients or equipment you have never heard of before (Coconut Aminos? Spiral Slicers?). Below is a breakdown of what some of these mystery products are, where you can find them, and why they are part of a paleo lifestyle. 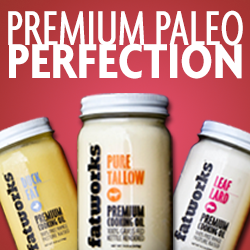 If you have to purchase just one product that will help you out on your paleo journey, it is probably this one. The Spiral Slicer is the latest paleo "must-have" kitchen tool, and with it you can turn many vegetables and fruits into healthy (and paleo friendly) noodles! I haven't seen these is stores but I recommend this brand online. Zucchini and sweet potato noodles are among the top favorites, and with some homemade spaghetti sauce on top you really won't be missing your wheat pasta anymore. My favorite recipe is Zucchini Noodles with Avocado Cream Sauce. Coconut Aminos are the paleo equivalent of soy sauce, and you will find them used in a lot of recipes for marinades, dressings, stir-fry, etc. These can be found at many natural food stores, usually near the soy sauce, or you can just order them online. Almond Flour is found in many paleo baked goods because it is used as a substitute for wheat flours. For those that are allergic to nuts, Sunflower Seed Flour can be used as a one-to-one substitute. There are many brands of almond flour available in stores, but the only type I recommend using is one made from blanched almond flour that is finely ground. Any other brand will usually result in a crumbly mess. Make sure you are not buying almond MEAL, which is not blended as fine and will not work as a replacement for almond flour. Coconut Flour is coconut that is dried and blended into powdered form. It is frequently used in paleo baking and is rich in fiber and protein. Coconut flour is very absorbent, so it can't be use as a 1:1 substitute for wheat flours or almond flour, but you generally only need a small amount compared to other paleo flours. It can be found at most natural food stores in the baking/flour section and is also available online. Tapioca Flour is an alternative to traditional wheat flours and has a variety of uses in gluten-free baking. It is made from the starch of the cassava plant. Tapioca flour helps bind gluten-free recipes and adds a chewiness to baked goods. It is a great thickener and can be used as a replacement for cornstarch. Tapioca Flour can be found at most natural food stores in the baking/flour section and is also available online. Arrowroot is used in baked goods and also acts as a thickening agent, so it is an excellent substitute for cornstarch. It is an easily digested starch extracted from the roots of the arrowroot plant. You may hear it called arrowroot starch, arrowroot flour or arrowroot powder. Arrowroot flour can be found at most natural food stores in the baking/flour section and is also available online. Kelp Noodles are....noodles made from kelp! They are a gluten-free alternative to wheat noodles and are great with a sauce or tossed in a salad. They are crunchy right out of the bag, but can be boiled to get a softer more noodle-like texture. Kelp Noodles are available at some natural food stores, but I have had the best luck purchasing them online. Raw Honey is unheated, unfiltered and unpasteurized. It is usually at a solid state and a light color. Because it has not been heated and treated, it retains it's natural enzymes, nutrients, and antioxidants. It also has an amazing flavor (far superior to the stuff that comes in the bear!). Raw Honey is available in most natural food stores and also online. Coconut Butter is made from only the flesh of the coconut that has been well blended. It will be in a fairly solid state at room temperature but can be easily warmed to make more spreadable. It is used in many paleo recipes and there are many ways to enjoy it. Coconut Butter is full of fiber, protein, vitamins and minerals. It can be found at some natural food stores or also online. Side Note: It does not taste like butter, it tastes like coconut, because that's what it is! Coconut Oil is a healthy replacement for many of the other oils available on the market such as canola oil, vegetable oil, etc. Look for an unrefined coconut oil, which is usually labeled "virgin" or "extra-virgin". Coconut Oil is often used in paleo baking, but many people use it for cooking as well. It is available in most natural food and grocery stores, and is also available online. Ghee is clarified butter which has had most all of the casein and milk solids removed, making it tolerated by many people who cannot usually handle dairy (or lactose). This is not considered paleo by some people as it is a dairy product, but others enjoy it for the health benefits and incorporate ghee or other grass-fed dairy products into their diet. Find what works best for your body! Ghee can be found at most natural food stores near the butter section or online. Coconut Juice is also called Coconut Water and is made from the water found inside young coconuts. It is not the same as coconut milk, which is often used for cooking and baking. Coconut water is a refreshing beverage that is very hydrating. Different brands will have different flavors based on where the coconuts are harvested from. Coconut Juice/Water can be found at most natural food stores or grocery stores and is also available online. A wonderful page. Good description and photos are a huge help.